Whip up our Healthy Living Cucumber-Dill Salad in just 10 minutes. 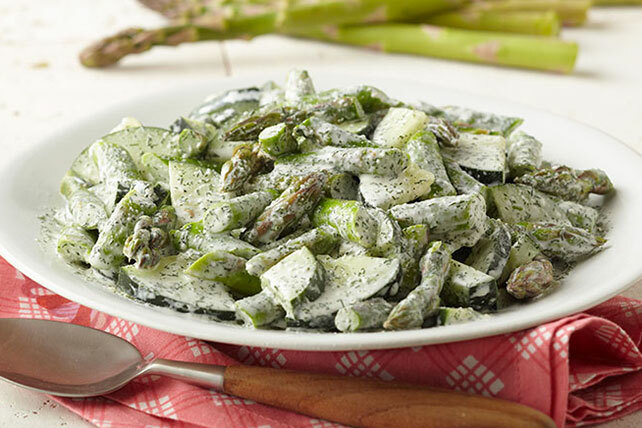 This Cucumber-Dill Salad is a refreshing dish that smells as good as it tastes. Place asparagus in microwaveable casserole dish. Add water; cover with lid. Microwave on HIGH 3 to 5 min. or until asparagus is crisp-tender; drain. Rinse with cold water; drain. Mix next 4 ingredients in large bowl. Add asparagus and cucumbers; toss to coat. Substitute 2 Tbsp. chopped fresh dill for the dill weed.